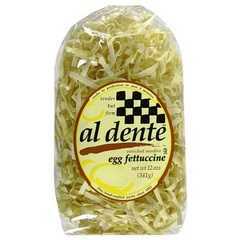 Enjoy Al Dente Egg Fettucinne (6x12 Oz). Perfect for any occasion, any recipe, whether it is chicken soup, fettuccine alfredo or simply pasta with fresh tomatoes, olive oil and Parmesan cheese. Parents from all over the country write to us saying that even their kids can tell the difference between Al Dente Egg Fettuccine and others. That makes us feel so good! (Note: description is informational only. Please read product label prior to use and consult your health professional with any question prior to use.